The New York Giants have reinstated starting cornerback Janoris Jenkins, ending his team-imposed suspension after just one game. It is the second such one-game suspension that the Giants have imposed on one of their starting cornerbacks this season, having done the same with Dominique Rodgers Cromartie in Week 6. The Giants secondary struggled in Jenkins’ absence, with Rodgers-Cromartie, Eli Apple, and Ross Cockrell posting game grades of 50.2, 38.1, and 36.4 respectively in the team’s 51-17 loss to the Los Angeles Rams. Cockrell had a particularly tough day, allowing a passer rating of 151.2 into his coverage playing in place of Jenkins. 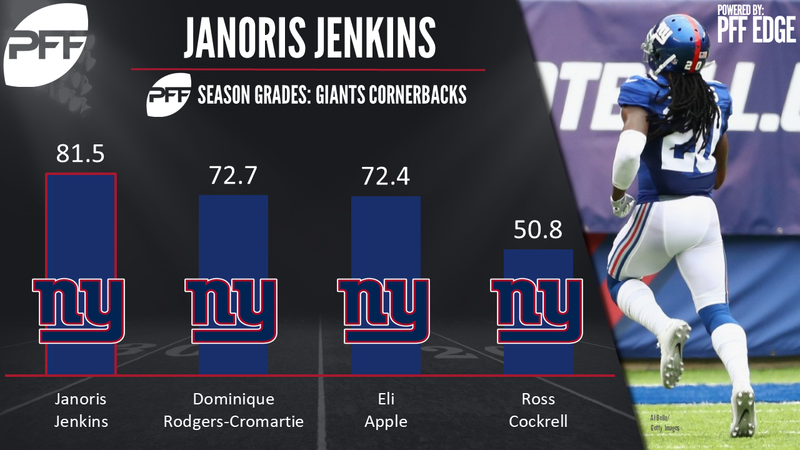 Jenkins has been the Giants’ most impressive corner this season, having allowed a passer rating of 70.9 into his coverage which ranks 16th among 73 qualifying NFL cornerbacks through nine weeks. The Giants have opted to use him to shadow opposing No. 1 receivers in three games so far this season. In those games, Jenkins allowed a combined nine completions on 18 targets to Dez Bryant, Mike Evans, and Demaryius Thomas for a passer rating of 78.0.